Hardwood floors continue to grow in popularity across the country. Whether it’s new hardwood or refinishing existing hardwood floors, it’s all about wood. Tons of customers are ripping up their carpet and refinishing the wood floors underneath. Almost everyone seem to want hardwood. In fact, even in non-hardwood surfaces (such as tile, luxury vinyl and laminate), it’s all about imitating the wood look. And, wood is now the most popular flooring surface in kitchens. Bear in mind that just because something is trending or is popular, doesn’t mean it’s right for you, your family or your home. I always recommended that my customers do what they like and what feels right for their style/decor and their lifestyle needs. Please note that this article may contain some affiliate links. You can read my full disclosure at the bottom of the page. 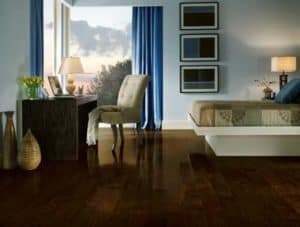 Yes, dark hardwood flooring is the most popular and continues to grow. Now, most home owners are looking to go darker and darker. It seems that the most popular seems to be a 50/50 blend of ebony/jacobean (sometimes called espresso) and 50/50 ebony/dark walnut. And, of course the pure forms of ebony, jacobean and dark walnut are super popular (those are named from darker to lighter). Due to high demand for super dark (or ebonized) floors, around a year ago, Duraseal introduced a new stain color called True Black. It’s even darker than ebony and it’s more opaque. (Note: these floors are challenging to maintain as they show every bit of dirt). Above right, you can see Duraseal True Black (#199). And, below, you can see a stain test showing True black (left) vs Ebony (right). Most of my customers who prefer dark flooring are going for a more opaque look – one that shows less graining. The darker you go, the less you see the graining and you also see less color variation in the wood planks. Many prefer this look both because it’s more contemporary and also because the floors are more uniform making it easier to decorate. If you’re looking to buy the True Black stain, you can purchase it online at Amazon by following above link or clicking on the picture of the can. It’s not available in most stores yet. Note that the darker you go, the more you will see dirt and scratches. For that reason, many of my customers who love the darker ebony look will instead go slightly lighter (e.g. dark walnut) as they are much easier to maintain. The 2nd most popular color is going very light, and lately it’s been lighter and lighter. Many prefer this crisp clean look and they want to avoid the yellows/golds. For that reason, more and more have been going towards water borne poly, especially the higher grade Bona Traffic HD. Bona Traffic gives you a light, fresh and natural look. It’s the lightest you can go (unless you bleach the floors or add white wash). The look is contemporary and it has a more matte finish. Bona Traffic HD is a wonderful product (the highest grade water borne poly) – strong, durable, and it both dries and cures quickly (thereby reducing the time to be out of the house). And, it doesn’t smell as much as oil based poly. Bona Traffic HD does cost more than oil based poly, but it’s worth it if you want this fresh clean and contemporary look. White washes also continue to make a comeback. They tend to be more popular in pre-finished woods (as opposed to floors that are site finished) as they generally come out lighter. This is due to the wood used (i.e. lighter species and newer wood (which is lighter) and the finishes and treatments available in the factory. The whitewash stains available in the general market are a bit light/watery. My prediction is that eventually Duraseal will come out with a more opaque white stain. With white wash stains, you must use a water borne poly; otherwise, the floors will turn yellow. Bona Traffic is by far the best choice, especially for white washes, both because of its durability, but also because it amberizes the least. It looks the best both short-term and long term. Regardless of whether homeowners are going natural or white washed, or using water borne or oil based poly is used, satin and matte finishes are most stylish. 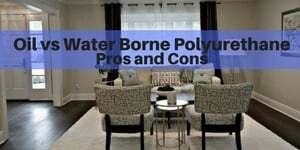 Oil vs water borne poly – which is better? 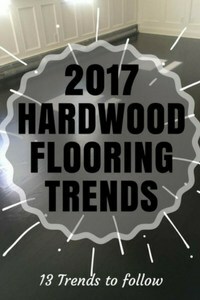 The demand for gray hardwood floors continues to increase. Some prefer lighter grays and other prefer darker grays. Over the last year or two, I’ve also noticed a rise in gray/brown blends. You can read much more about how to refinish existing floors to make them gray in this article: Staining hardwood floors gray. Please note that this is not easy (I get calls and comments from homeowners all across the country where things didn’t turn out right). So, if you’re planning to refinish your floors gray, check out the article (and I’d recommend hiring a professional and someone with a lot of experience doing gray. Refinishing your floors gray is more expensive because you really need to use Bona Traffic HD. Because it’s more expensive and more challenging to decorate with, many end up going with a dark stain for the floors and gray paint for the walls. This combo is much easier to decorate with. Will gray go out of style? 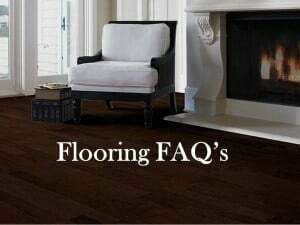 Yes, probably…but probably not until it’s time to refinish your floors anyway. Shiny finishes are definitely out. They are dated and impractical as they highlight the dents, scratches and dirt more. The clear preference is for satin which is much more subdued. It has a lower sheen and tends to hide imperfections more. With the rise in water based poly, along with grays and white washes, matte finishes are starting to rise in popularity. You can read more about finish and sheen levels here: What type of sheen is most stylish? Note: the more muted satin and matte sheens are more popular both in lighter and darker colors. Oiled floors are a fairly recent phenomenon and they’ve become more popular over the last couple of years. Oiled floors don’t use polyurethane to coat them. 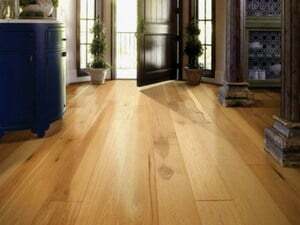 Instead, they use an oil (e.g Rubio Monocoat) that penetrates into the wood. This gives the wood a unique patina and texture. It’s more natural looking and has a duller finish. 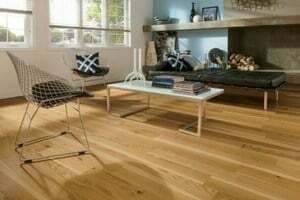 Most oiled floors use linseed or tung oil, or a combo of the two. Some use safflower, soy, sunflower or hemp. Some formulas use resin as waxes, such as bees wax or carnuba for higher durability. The oils penetrate the wood and attach at a molecular level making the wood stronger while leaving the texture and color unobstructed. Over time, the oil ages with the wood and the patina grows stronger. One of the advantages of oiled floors is that they are easy to repair. In fact, you don’t need to sand and refinish it as it scratches. Instead, you can repair it yourself by adding more oil. The oil is easy to use and extremely low in VOC’s. The oils enhance the natural appearance of the wood. 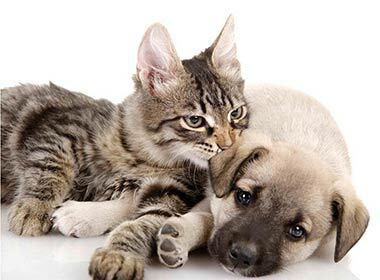 The disadvantages of oiled floors is that they can often be more difficult to maintain (you need to periodically treat the floors with more oil) and the floors aren’t protected from water (or pet urine). Polyurethane provides a protective layer that rests on the wood and prevents water from penetrating. Oiled floors don’t protect the floors in the same way. They require a lot more regular maintenance. Importantly, with oiled floors, you would not use a regular hardwood cleaner. Instead, you would use Woca natural soap and the Woca Wood Refresher. You can easily buy them on amazon by following the links in this paragraph. 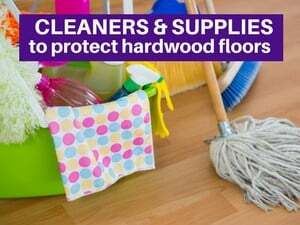 These items cost more than the typical hardwood cleaners, but at least you can make repairs as scratches occur. Wire brushed floors have been on the rise the last couple of years. These floors are etched with a subtle texture to enhance the graining of the wood. Wire brushing pulls the soft grain from the growth ring leaving the heart wood exposed to the surface. It’s stylish and helps mask everyday wear and tear (and dirt). Wire brushed wood has a bit of texture, but it’s not rough like distressed or handscraped wood. Wire brushed wood has a real vintage look. Wire brushed wood is usually factory made, so it’s generally in a pre-finished form. Occasionally, you can find some people that have a wire brushed sander, but these are few and far between. Wider planks have been preferred and on the rise for years. They are more popular and they make your space look larger. The standard that you see in most homes built from around 1950-2000 was 2 1/4″ strips. Now, people prefer to go at least 3 1/4″ wide (this makes a huge visual difference) and even wider (e.g. 4″, 5″, 7″). The preferred width can vary based on whether the wood is solid or engineered (prices shoot up much faster in solid wood and the planks expand/contract more), size of room and budget. And, for those going for a more rustic look, wider is better (e.g. 7″ and even wider) for a more vintage look (as that’s how old pine floors were made). Over the last year or so, I’ve noticed an uptick in using multiple widths for hardwood floors. It seems to be a return to historic and more authentic floors. Historically, floors were multi-width to utilize the cut of the trees in the most efficient way. 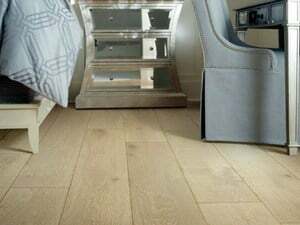 Note: Multi-width planks seems to be a bit of fad that comes and goes over the generations and it can date your house. Hardwood colors change over time, and it’s easy to change their when you sand and refinish. But plank width and pattern are permanent (or may be there for 100+ years), so consider that you’ll be living with these for a while. 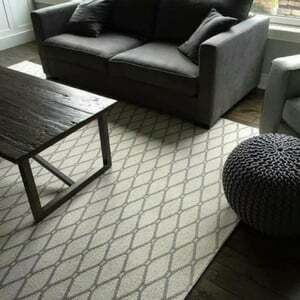 Chevron is the more contemporary version of zig zagged wood. Herringbone gives a more historic look and Chevron is more angular and action oriented for a more modern and action oriented look. Chevron can be seen above and herringbone below. Chevron is a tad more expensive than Herringbone (and requires a bit more skill). 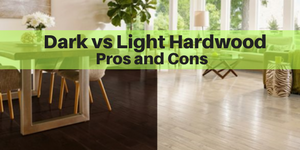 Both of these are more expensive vs. a standard straight lay as the wood needs to be specially cut, it takes more time and skill to install and it takes longer to refinish as you need to refinish the floors in both directions. Imagine a V being repeated again and again – that’s a Chevron. The flooring is cut at an angle so that the pieces come to a point. Herringbone floors are not cut at an angle, and they are created by placing the rectangular pieces in a staggered pattern (similar to cobblestone roads). There’s been an overall mega trend to return to the past and simpler times. We’ve seen this in decor styles, especially in kitchens (think French Country kitchens) where many want to have a friendlier and more approachable home – one that fosters communication and reduces formality. The farmhouse style (or shabby chic) provides a rustic and time worn look. This provides a sense of style, but also provides an easier way to maintain floors. The floors naturally have more character (in color, texture, mineral streaks and graining) so they camouflage scratches. 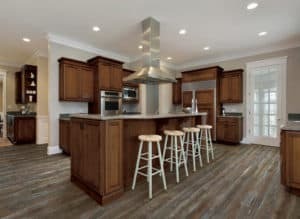 Farmhouse flooring is usually wide plank (often 6-10″) and often uses multi-width planks as they mimic the look of floors from the 1700 and 1800’s. These floors often come in pine or character grade oak with mineral streaks and lots of knots. Here in the Northeast and Mid Atlantic area, you can find homes from the 1700’s and 1800’s. We’ve had the honor to refinish many floors from the 1700’s. These floors are stunning and witnessed a ton of history. These floors have character, including gaps between the planks. Many have face nails (as that’s how they were installed in those days. Some of these farmhouse floors have warmer tones (as old pine does) and some is reclaimed wood. Some have darker and cooler tones for a aged vintage look. This wood is not cheap. People are choosing it for a style statement. Yes, the trend is buying local and home grown woods. Oak is the most popular (and reasonably priced. It’s timeless. It’s practical in that it hides dirt and scratches more and it’s easy to sand and refinish. Maple, pine and hickory are also popular. With maple, many are going for a light northern European look (there’s a strong preference for clear grade which has less color variation). 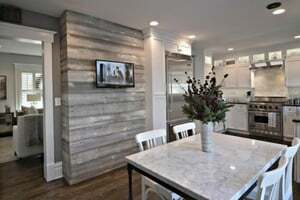 When it comes to pine and hickory, most are going for a more rustic look with lots of color variation among the boards and lots of knotting for an old world style. Part of this trend is due to economics – Domestic species tend to be less expensive – plus, many would just prefer to support our local economy and part is due to aesthetics, especially as there is a strong preference towards darks and cooler shades and reds have become dated. This contrasts with the trends 8-10 year ago towards the exotics (e.g. Brazilian Cherry, Mahogany and Tigerwood). These floors (especially the red colors) have become rather dated and are certainly less popular among most home buyers. They also tend to show scratches and dirt more. As more people care about the environment, there seems to be a trend towards more sustainable wood and making sure that their floors will last longer. There is a strong preference towards solid, as this will last a century or more, and towards woods that will hold up better. 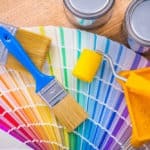 As the economy improves (bit by bit), and as more cheap products have been exposed (see 60 Minutes episode), more homeowners prefer to pay a bit more to get a wood or a finish that will last longer and avoid the inconvenience and future expense of needing to refinish (or replace) sooner. People are wisening up to the concept of “you get what you pay for” especially as some of the cheaper woods coming from China just don’t hold up well, and many have adhesives laced with formaldehyde. More are going for higher quality woods, even if that means doing a smaller area. They are also choosing higher grade polyurethanes and doing more coats. 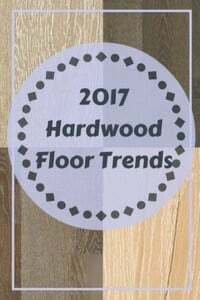 There you have it – 13 hardwood flooring trends for 2017. I would expect these trends to gain even more popularity over the next few years. Several have been growing for a decade or more and some are new trends over the last year or two. 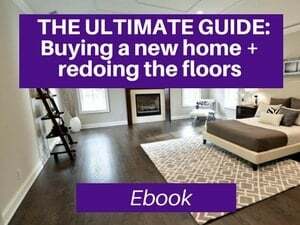 As I mentioned before, while it’s good to know what the trends are, it’s more important that you love your hardwood floors, and you do what you love and what works best with the style and decor of your home. All homes are different, and everyone’s taste is different. I recommend that do what you love, regardless of whether it’s on trend or off trend. And, remember, hardwood is on trend…so you can’t go wrong with hardwood. 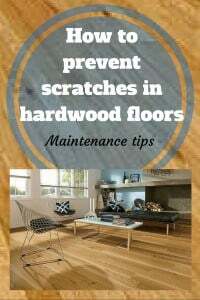 How to prevent scratches in your hardwood floors. I would expect trend toward the dark and the gray would pass quickly as it has come and gone before. I have never seen the Chevron, and like it a lot! Must be expensive, unless the pieces come in the box at the desired lengths. Jay, I would expect gray floors to pass in the next 5 years or so. I would expect dark to be longer lasting as it has been growing for a while and seems more stylish. It is an excellent pallet to decorate from. Many will gravitate towards a bit less dark as it’s more practical. The chevron is cool. It’s definitely more expensive. 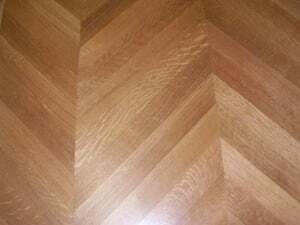 Yes, the pieces are specially cut, but it’s more labor intensive to install (even moreso than herringbone) and the pieces tend to cost a bit more than the precut herringbone due to the angles. And, you need to sand in 2 directions, so again a bit more labor intensive. Do you think an alcohol wash is necessary after sanding floors? If so how much should this cost? Cindy – I’m guessing you’re referring to a water pop, and you can read more about that here: What is a water pop and when would you do it? If you are staining your floors and they are oak, then yes, it will make your floors look better and stain will move even. If you are doing natural, or it’s a different species, then no. Cost will vary based on part of the country. I would guess maybe .75-$2.00/sf assuming you have at least 500+ sf (otherwise, it would probably be more per sq ft). A beautiful comprehensive and informative post. We will be taking advantage of your great tips in our future rehabs. I can tell you from experience that Bona as you recommended is a fantastic floor cleaning. Thank you so much, Beth. Yes, hopefully this will help. You guys are pretty close to us. Great to hear from you. I have a question about laying natural oak flooring around a round brick hearth. We currently have carpeting but I would like to change to hardwood and replace the carpet. I like the “picture frame” transition from floor to hearth but with a curved/semi-circle brick hearth, I don’t think this is possible. Ann – First, yes, do whatever color you prefer. Second, yes, it’s tricky with brick and even trickier if it’s curved. You probably need to get some talented installers who can scribe around the area. I have seen some curved wood that is specially fabricated as well (it gets expensive). You’ll definitely want to do this unfinished for a cleaner look after it’s sanding. Prefinished won’t work. Alternatively, you could try a flexible rubber piece, but this obviously doesn’t look as nice and it will be challenging to get it to match the color and graining of the wood. Sometimes, in specialty lumber stores, they have some rubber pieces/moldings that have a wood grain and then you can stain it to the color. I hope that helps. I think you mentioned how reds don’t do well last year as well. When I chose the custom colors for Uptown Floors I put a few reds in there and low and behold they became the biggest sellers. So I added more with some brown tints. Gray surprises me. Very few sales. Natural finished hardwoods on the other hand are running second, followed by beige and light browns. That’s a good sampling that covers about 20 states. Ken – Interesting that you’re seeing that. Yes, reds are VERY dated here. And, in fact, I have a survey question on my site with over 1000 responses and only 13% like reds (or oranges). I can see it being more popular in the south and the trends tend to start here. All that aside, when you are offering a whole line, I would think you would want at least 1-2 reds to satisfy the breadth of preferences (the concept is “variety without duplication”). One of Coretec’s most popular items is a red, too. But sometimes these items become more popular as there are only 1-2 options, so everyone who likes that range just picks the 1 color. So, all in all, you want to have that variety in the line, but the overall preference here is to move away from red…and in fact, I get lots of requests from homeowners here (and across the country on the blog) for drowning out the red. Ken – Yes, gray is popular here, but many end up going dark instead. When they think it through, dark is much easier to decorate with. And, yes, I agree light/natural is 2nd here. 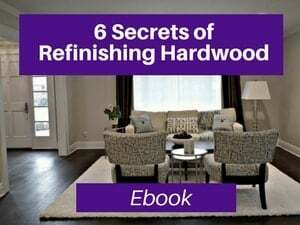 Part of this difference we may be seeing is based on type of wood – you probably have a lot of prefinished wood whereas here people are more often refinishing existing wood. And, the finishes are different. Here in the Southwest, our customers prefer the light colored flooring. One of our customers chose a dark (Ebony) color, and the very next day, we had a dust storm (very common here in the desert). The customer was not very happy as the dirt was very visible with the dark colored flooring. We decided not to “upsell” the dark colors after a few complaints, instead the light colored flooring – which goes even better with the Southwestern decor! Charles – Yes, I can see lighter working better in your area and I’ve heard some others in Southwest say the same thing. The weather and home styles vary by area of the country. And, yes, darker is shows dirt more, and it probably shows even more in areas with more bright light/sunny days. 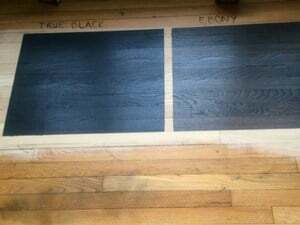 Any recommendations for my contractor around the process of mixing ebony and Jacobean? He says he has never done a mix. Thanks! Hmmm. That really should be that hard. That’s odd that he’s never mixed. He needs to carefully measure so it’s a one to one ratio. He will need to mix in a separate container. I supposed if he feels really uncomfortable, he could also test espresso which is generally a 1:1 ratio of these 2 colors. Neet some advice. We are redoing our kitchen which butts up to our dining room. We put teak hardwood flooring in the dining room over 20 years ago and purchased from an auction. Can’t match it up. On the other side of the kitchen, we have a laminate in the family room (it has a step down from the kitchen). I’d like to put in hardwood in the kitchen and hallway (which are continuous) but am concerned that there would be 3 different “wood looks” on the first floor. Any suggestions? This is a toughie. If you can’t match, you can’t match. But, if it Brazilian Teak, you should be able to get additional Brazilian Teak. It may not look exactly the same due to the aging. An alternative, especially if you have extra left over is that you could “integrate” teak into the kitchen via a border. This depends on size/shape of kitchen. I might try this with maple as the main color as it would be the lightest wood and give you the most contrast with the teak/teak border. I’d also probably try to replace the laminate to match the kitchen area, even if you need to do later. My hubby chose red oak for throughout our upstairs, uncharacteristically not asking me first. This is what we have throughout downstairs of our 25-year old custom built Victorian with mahogany stained woodwork (that’s tough). Project almost complete- no going back on that. Do you still recommend a natural satin finish or is there a finish that will diminish the look of the red? Exceptional post by the way! Thank you!!! I would probably use Bona Traffic HD for the poly. This is natural. This will give you more contrast vs mahogany woodwork and it will probably be a bit less pink. It won’t get rid of the red, but it will be a bit lighter/less red. The only other ways to reduce the red are 1) on the light side, bleach the floor and do white wash…but you may not like it…white wash works way better on white oak than red oak and you may still have pink undertones (and the bleach isn’t wonderful for the wood) or 2) go darker to drown out the red (but you may not like with the mahogany wood work. so, that’s how I gravitate towards natural and Bona Traffic. Note: Bona Traffic does cost more than oil based poly. You can read more about brands of poly here – Brands of poly I recommend. Hi Ann. Glad this has helped. I’d probably go for oak – either very dark or very light (i.e. natural) to go with your furniture shades. I hope that helps. Choose red oak if you like more graining/more traditional or choose white oak if you like less graining. Going for a contemporary look. Please advise which manufacturers carry true grey wood floorings … showing minimal wood grain, wide plank, matte finish? Thanks! If you are looking at prefinished wood, you will want to look at these in person. Rather than suggesting a manufacturer (because there are many out there and many opinions on color), I would recommend going with a maple species (or birch). Maple is stronger of the two. Maples look more modern and tend to give more of a true gray look and less graining. Many manufacturers are using matte or satin finishes for gray now. I’d recommend you go to a local store and see what you like. Hi – I read in your informative article here that for white-wash stains you recommend water-based finish only. Because of the durability issues, the floor refinisher recommends oil-based finishes, as you do. My color choice for our red oak ’89 floor refinishing (2nd x) is a mix of about 40% Daly’s stain “Frost” and 60% “Fog Mist”, which looks darker/more red on the red oak than it does in this sample: . So, it appears to be a mid-white wash, not grey, but more of a taupe. Do you think I can get away with an oil-based Glitsa on top? I will anticipate some yellowing, but how soon would it be noticeable? Absolutely NOT! You should only use water based and I would only recommend Bona Traffic for this job. Bona traffic will last just as long as oil based. They are equal in durability. You need water based for anything white or gray or in that range, otherwise, it will turn yellow (and get more yellow over time. I could have sworn that I had responded to this comment a week or so ago. 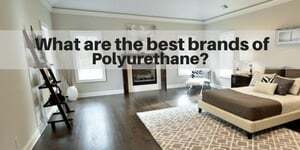 You can read more in this article: What are the best brands of polyurethane? Hi! I live in a North facing 1963 ranch house in Milwaukee, WI. We are currently refinishing our oak hardwood floors. I think they are red oak but I would be lying if I said I knew that for sure! I had my heart set on Minwax Dark Walnut (a nice medium brown) but my husband thought that would be too dark and the floor guy warned the floors would turn out dark. So we tested Minwax Special Walnut (floor guys recommendation) and Expresso (I know a dark stain but didn’t look as dark at the store)…I decided that the Special Walnut because it looked just dark enough and just warm enough. Plus I liked that the grain looked smooth and not so in your face. Well we went to look at it yesterday and it’s way too light! Problem is the floor guy put a poly layer on already. So he told my husband he would mix stain and poly together to get the floors a bit darker. My question is- will this work? In general how many layers of Special Walnut stain do you usually recommend? Also IYO would dark walnut be too dark on a North facing ranch? Cynthia – Oh gosh, I feel your pain. First, I think dark walnut is nice (espresso, by the way is darker than dark walnut), but if you were concerned about dark walnut being too dark, I would have advised you to test antique brown and coffee brown. Those 2 stains are a bit lighter than dark walnut and darker than special walnut. Second, obviously, it would have been better to check the stain before the 1st coat of poly went down if you were unsure about color, but I get that it’s too late now. Third, he only should have done 1 coat of stain. That is the best way to go. Putting down 2 coats of stain is bad form and can create issues with adhesion (so the poly could peel later). Now that this has been done, the contractor’s suggestion of mixing in some tint with the poly is a good one. You can do this on the top layer of poly. Now, when you do this, it weakens the poly a bit, so it’s important that you have 3 coats of poly (and not 2) and then the 3rd coat would have the poly. (Note: if you were planning for just 2 coats of poly, this will cost extra, but you really should be doing 3 coats anyway (with or without the tint). We have done this a few times for customers when they chose and approved the stain and then later changed their minds. Bear in mind that this will only make it a little darker. If you want it much darker, then you will need to start from scratch and resand everything. If you are totally unsure, see if there is a way to “test” it in one room. This would delay the process (and possibly cost a bit more as the contractor needs to make more trips), but you could see how you like the one room and if it’s dark enough then do the rest of the area; if it isn’t, then resand. I hope that made sense. We did have our floor contractor add a little stain to the poly as you suggested…it made it a tad darker. Overall we do like how the floors turned out- they are beautiful. Also, I think since we live in a North facing ranch we made the right decision going with Special Walnut. Plus once our white trim is up and the walls are painted a light griege, I think the floors will end up looking darker. I am still in love with the look of Dark Walnut floors and I will always think “what could have been” but alas they were not to be in this house! BTW I love your blog, so much wonderful information!! Cynthia – Thx for coming back and providing. I’m so happy that things turned out well. Sometimes, things work out for the best. And, thank you so much for your kind words. That means the world to me. Great read here. Thank you. What are the thoughts on 2 different types/colours in one house. My main floor is a dark oak and the rest of my house is carpet. I’m thinking about ripping out the carpet and laying down some boards, however, my style and preference is different from the current oak floor that I don’t want to replace. Is it a terrible idea to go with what I like now on the 2nd floor of my house if the 1st floor wood is different? Keep in mind that I would want to do the stairs as well which would lead right down to the dark oak. Thank you, and thanks for you work. Dean – Thanks so much for your kind words. I think it’s fine to switch on the 2nd floor, especially if you don’t like what’s on the 1st floor. Generally, though, you would do the steps the same as the 1st floor so it’s cohesive look on 1st floor. I hope that helps. We have a 1920 home with 2.5 inch red oak strip in the parlour The colour is walnut with golds. It was cut on the quarter so colour variation is big. The stairs are also in that colour with white risers. We are doing our entire upstairs and need to rip out the old floor which is ruined. I don’t know what to replace it with that will work with the rest of the house. I love walnut but that would be too different. I don’t know if white oak will be ok with the red oak. Help! First, I should warn you that this will probably a larger job than you are anticipating. Based on time of house and wood not lasting well, it’s most likely that you don’t have a subfloor, or don’t have a good one. So you may need to add a level of plywood. I would strongly advise against walnut, as that is very soft and very expensive. I’d probably do oak and stain it with a walnut/darkish brown stain. I’m not sure that I would let 1 room on a different floor dictate what you do in the whole house. If you like white oak better and it’s on a different floor, I’d probably say that. I’m guessing what you mean is that you have quartersawn oak. That is more expensive. I’m surprised about the color variation as normally there is less color variation with this cut, but there are more rays. Bear in mind that if you did red oak select, it won’t match that anyway, so if you like white oak better, do that…neither will match…unless you do red oak quartersawn (which will cost a lot more), but chances are that won’t match either as it hasn’t aged for 100 years and the standards for quartersawn are different now vs 100 years ago. Watch out as old homes almost always cost more to renovate, and be prepared to do subfloor work. We are planning put the Rich Acacia laminate flooring. I think it will be too dark but my husband has liked that. I am thinking of going little lighter like grey or bamboo color. Kamini – It really just depends what you like. Acacia is redder, which some people love and others hate. It is more challenging to decorate with. 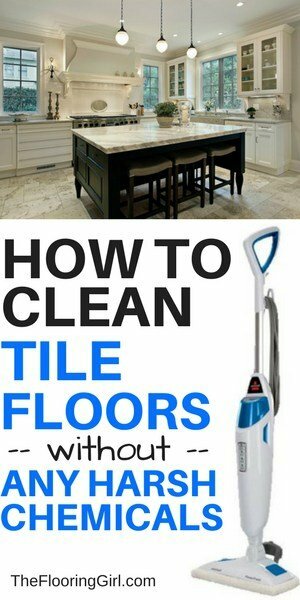 Lighter will make you space look larger and will be easier to clean. I am going to put hardwood floor on my whole house except kitchen area which has a darker colour of ceramic tiles. I am debating beween dark or natural colour. Here in Toronto, all the high end homes seem to havedarker colour hardwoods. Will the natural colour hardwood make the house looks very casual and not high end ? We have 3 kids and a small dog ? So we are thinking of Natural colour wide plank (6″-7″)hand-scraped engineering floor. Do you think we are making a good choice in terms of selling value down the road in a few years ? Sawanee – Toronto is very much like New York and here, dark is preferred especially in higher end homes (as you indicated for your area). For those who like natural, they are going towards Bona Traffic finish/look – lighter/less yellow. It’s a more sophisticated look. BTW, I don’t know if you live in a house or condo etc with concrete subfloors. If it’s a regular house with plywood subfloors, I would advise you do solid rather than engineered wood, especially if you have a dog. Also, here handscraped is very niche, so if you’re asking whether it will hurt in resale value/likability, I would venture to say yes, as it’s very taste specific and the majority of people don’t like it. On the other hand, this is your house and you need to choose what you love and what’s right for your family. It’s all about choices and tradeoffs. I hope that makes sense. I’m so glad I stumbled across your website, thanks for so much great information! We are going to do a big (first ever) reno in our little ranch home that we’ve been in since the 1980s. We are knocking down a wall to make it an open kitchen, livingroom, dining room combo, gutting the kitchen and ripping up the floors to make it all hardwood throughout. Hubby likes dark kitchen cabinets, I like dark floors. I’m sure that’s a no-no in a small house. Can you recommend a compromise or suggestion of colors? We can’t get too crazy in this small house, I like the simple, clean, shaker style cabinets. But there are too many options out there! Thanks in advance! Hi Rosie. Thank you so much for your kind words. They mean so much to me. The most popular combo right now is dark hardwood floors and white cabinets (or cream). And, no I would never do dark and dark…totally agree. Another potential solution is to do dark floors with gray cabinets. That is an up and coming trend. Another thing I see people do is make a big island in a different color. So, you could do dark floors, white cabinets on outside and dark cabinets on island (or potentially vice versa). On the flip side, if none of those work, try super light floors natural with bona traffic and then dark espresso cabinets. Oh and I agree, make the cabinets simple. I don’t know what they’re called or how to describe them, but I like the doors with flat rectangular outline. I hope that made sense. But, definitely simple without lots of edges/grooves. I would do brushed nickel hardware – clean and simple ones. Our current home has oak cabinets/woodwork/doors throughout in a reddish-brown chestnut tone. Floors are currently standard floor tiles in kitchen/foyer and beige carpet. Would like to replace with hardwood in a “current” color but how to handle the reddish-chestnut colored cabinets/woodwork/doors running throughout the house? what would you recommend that will be current for quite some time? Hi Pam. Yes, I hear your dilemma. Red and golds are a bit dated. I would consider painting cabinets white as that will be more in style, brighten up the place and give you more flexibility with the floors. The type you have are the most challenging to work with. Hi Debbie- very informative, thanks for such detailed advice. We are purchasing a 1962 ranch in the Hudson Valley, not far from you, in Dutchess county. The goal is to add the flavor of a mid century modern home, with a touch of a more updated look. The house has hardwoods throughout (except the kitchen) Around 2000 sq ft. – and small bedrooms. I like dark floors, I have sanded and applied a ebony look in a art studio in the past using a powder mixture, more than a decade ago. However in a MCM style home would you recommend a blonde floor. Grey would also be interesting- If furnishings in that period would work. Right now it’s the typical goldish looking good condition showing wear, but wanting a fresh look. Mark – Welcome to the area. And, or if you’re already here, congrats on your upcoming home. Oh gosh, this is such a judgment call and there are many ways to go. In the fall, we worked on a really cool mid century modern place (I think it had a famous architect, but not sure who and not part of Usonia). But, a super cool house that reminded me of Frank Lloyd Wright (or at least one of his houses). There were lots of windows and it was very cool. Part of this is choosing the right decor and hers was exquisite. On the main floor, we actually darkened the floors. I think it was around dark walnut and we did ebony. On the basement/lower level, we did a grayish luxury vinyl (Coretec Plus Boardwalk) with some hints of beige and it had a weathered/handscraped look. Her lower level was concrete and a big open space. She loves it. Gray could look cool, too, but make sure you have white oak. Or, else try going super light and do natural with Bona Traffic. All 3 of those options are contemporary to me. 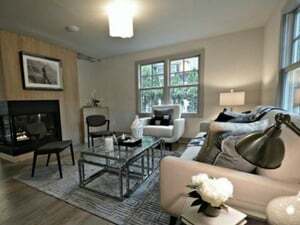 but, you have to look at setting and envision furniture (and make sure it works with your space (which I can’t see). BTW, I have seen many in Usonian homes with natural. Those homes tend to have more wood on the walls, so you can’t go too dark. Hi, we are currently remodeling a contemporary home in Dallas. We have just replaced the carpeting to match the existing red /white oak flooring – smooth finish. The new floors and stairs are red oak. We do not have young children or pets. I would like to apply a high gloss natural oil finish – will that affect the resale value in the future? We are from the North East and trends are very different between the regions. Diane – Here it definitely would impact your resale value. But, if it’s different in Dallas, look at what people there are doing. You could could ask a local real estate agent. But, bear in mind, if you are not selling now, it doesn’t matter…you can refinish or screen it later to change the sheen if you need to. If you are looking to stay where you are for a while, do what you like, as it is each to change this later. Bear in mind, glossy is very challenging to maintain. It will show every bit of dust. I’m building a house with 5″ white oak Our builder suggests for the poly we use the first coat oil modified sealer & then 2 coats of bona woodbine poly. We also have the option of using 3 coats Bona traffic hd. We understand the difference in color of water vs. oil but we are most interested in what finish will be the longest lasting. We would like to have a good 10-15 years before we refinish the floors. What do you suggest? I would think that 3 coats Bona HD would be stronger. Bona has a sealer option, too, but honestly, the 1st coat acts as a sealer. In general, using same type of poly and not mixing between oil/water and water is the better choice. Also, I’m not familiar with Bona woodbine. Never heard of it. Bona Traffic HD is the highest grade. You may want to call Bona’s tech department to confirm. Also, I’m not so sure 15 years is realistic. 10 should be very doable and maybe even 12. To extend the life of your floors, consider doing a screen and recoat and adding an additional coat at the 3-4 year mark. Thank you for your expertise. We like the way the water based polys look we were just concerned about their durability. Sounds like bona traffic hd is a strong product. 1 other question: are all polys oil-modified or are there 3 types: 1) water based (no oil) 2) oil based (all oil) & 3) oil-modified (water based with some oil added)? Right 3 types and you are best doing either all water (bona Traffic HD) or all oil. Oil modified tend to be inferior. You have been so helpful. You’ve cleared up questions that no one here seemed to be able to answer clearly. We really appreciate it! I’m so glad to hear that. Thanks so much. I love the detail you provide about trends. We have a mid century modern house with warm medium toned ceilings. What would you suggest for our floors? Eartha – Thank you so much. I really appreciate it. Since you’re ceilings are darker, I would probably go on the lighter side (most people have white ceilings, so any color works). I’d consider going natural (especially with water borne Bona Traffic) for a light airy look) or consider going a similar tone to your ceilings (if you like that color…I can’t see it, so it’s hard to say). This of course assumes you are leaving the ceilings and not painting them. Most of the homes that I’ve seen around here (like yours) are darker…and often need more light (as some of the windows are higher on the walls. Sometimes, adding some extra lights helps, too. I hope this is helpful. It’s much easier when you can see it in person. Alex – I’m so glad you are seeing the same trends where you are. It’s a very hot color now (even though it’s a cool tone LOL). Great articles! We always enjoy reading your blog – always up-to-date on the flooring industry today! Thank you so much, Alex. I really appreciate that. We have blond maple hardwood floors that were probably placed down decades ago (narrower). They could be sanded and refinished and look as good as new, but I realize these are not “on trend” like the wider boards. And yet I do wonder about the ecofriendliness of just keeping what we have. We live in a home in downtown Toronto originally built in teh 1880s but it only retains the Victorian facade and original stair railing. Otherwise all the Victorian features have been lost and the previous owners did a reno in the Italian modern style (they are architects). What do you think? In my opinion, my opinion only, with a home like that I would try to preserve what you can. That’s just me as I think it’s a shame to through away perfectly good wood, and historic wood. Also, the wood probably goes with the style of home you have. I’d be more included to refinish it and change the color, if you don’t like it. And, this is important…what do you like? If you like the current color and it goes w/ your home, keep it; if you don’t refinish it to a color you like. This is your home…and you should love it, regardless of style trends. We are in westchester and have red oak throughout house and in basement. Need to make a call on the basement stain color asap, and we will be redoing the upstairs in the near future as well. We are going for a modern look but also want it to be classic. 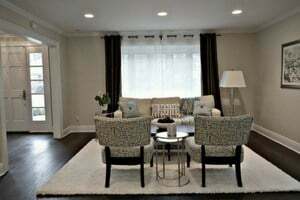 I have been really liking the new “light” trend I see in a lot of new construction listings but do not want to end up with red or pink floors because of the red oak and also don’t want anything yellow or orangey. Is there a stain color you would recommend to drown out the red undertone? We are already planning to use bona traffic hd as the topcoat. If we can’t go light, is there a darker color you find not to be too dark but still cancels out the red? Thanks so much! Okay, I’m answering these one by one and out of order and now I have the whole picture. For sure, going special walnut or darker will cover up any pink and any yellow. On the light side, to best avoid pinks/yellows, go natural w/ 3 coats Bona Traffic. DO NOT just use Bona Traffic on top coat – use Bona for all coats. DO NOT mix the oil and water. Do not do other brands/lower grades on other coats…well unless you don’t care about quality or yellowing. If you’re doing to save money, fine, but expect lower durability and more yellowing. many contractors will offer this to you to reduce costs. But, I’m here to tell you that it’s penny wise pound foolish. That is unfinished red oak, and I believe the stain is dark walmut. What do you think of IPE floor? Our designer loves that floor, she has it in our own house. At the beginning of the planning, she sold us on IPE for our project (a full renovation of a Montreal 1955 bungalow). But after looking at thousands of floors/rooms on houzz, My wife and I also like white Oak floors (light stain or natural color). When we go to stores to see the wood in person, it looks different to what we see on Houzz (I find it lighter in person). What are you thought about IPE vs White Oak about trend/ which one will age better (I know I’m comparing apples and kiwis!). We are starting a family in our house and planning to live there for a very long time. Also, most of the nice White Oak floors are Rift and Quarter sawn (when I asked questions about it). That type of cut is very expensive here Montreal (more expensive than IPE). 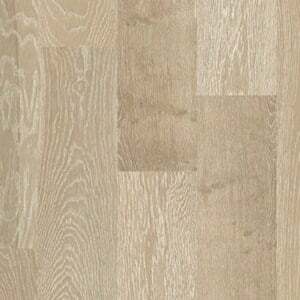 Is normal white oak with a proper finish could give a similar look? Louis – I think both options are great, and it does depend on which you prefer – light or dark. I love rifted and quartersawn oak (even more than regular select oak). It is more expensive, though. Not sure if it’s more than Ipe or not here. I have a hunch it all fluctuates. Benefits of IPE are it’s hardness/durability and smooth graining (and it’s pretty, but so is rifted & quartersawn oak). Downsides is that you are limited in color over the long run. With white oak, you can stain it or go natural for a light or dark look or anywhere in between. So, if your tastes change in the future, you can change the color of wood (and so can a future buyer, even if that’s 20-30 years from now). IPE, and other exotic woods darken over time, so the samples you are seeing in the store may not reflect that. Also, there is more variability in that product (both on board color and when wood is harvested/quality, so that sometimes leads to a color difference. Bear in mind, it’s very sensitive to light…so, you will want to wait at least 6 months before putting area rugs down (otherwise you will have huge marks around the area rugs. What kind of floor and colour is photo #9? 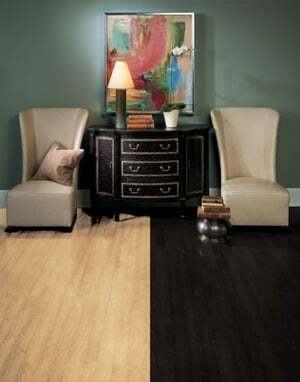 What do you think about two toned flooring? We just bought a house that has 2 toned 5″ wide engineered hardwood with both light and dark tones in the same plank. It was installed within the last year. I wasn’t a fan at first but it has grown on me. Is this a new trend or completely random? Lauren – If you mean 2 tones within the same plank, yes, that is popular. You see it in white oak and it’s one of the reasons white oak has been growing in popularity. The mineral streaking gives it a more natural and modern look. Or if you have hickory, you may see it there. that is a more rustic look and some people love that as well. Of course I can’t see what you’re looking at…just guessing from your description. Thank you for your great website and all the help you give to people. 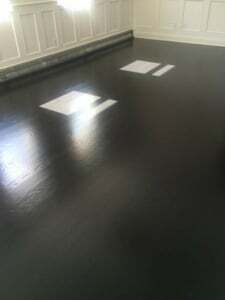 I had my oak floors screened and coated with one coat of semi-gloss oil-based poly. The floors are full of swirl scratches everywhere. The guy I hired to do it used a orbital buffing machine and he used a screen grit of 150. I always thought the grit should be 220 when screening. Do you think a 150 grit is inappropriate to use and could have been the cause of the swirl scratches? Do you think the scratches will lessen as time goes on? Michael – Oh gosh. It sounds like you hired someone who doesn’t know what they’re doing. First, you would generally use 180-220 grit pending the condition of the floor. But, you would NEVER use an orbital sander. This scratches the floor and takes off the finish! You use an orbital sander when you sand the floors, not when you buff them. You use a buffer for buffing the floors. It sounds like now you’ll need to do a full sand and refinish to get rid of the scratches created. Thank you very much! I don’t know if it is “orbital sander”, per se. As a layman, all I can say is that it was a machine with a circular bottom that they attached sandpaper (or screens?) to and, while walking upright, you push the machine. Maybe it was a “buffer”. Let’s say it was a “buffer” – would that change the way you feel about this situation? I don’t know if it was sandpaper or a “screen” but I do know it was 150 grit. The reason why we had this floor screened and coated with a fresh coat of poly is because we had a flood and, although the floor did not cup or anything, the poly finish on the floor changed and looked weird. So, we simply wanted to screen it and put on a fresh coat of poly to make it look better and to add fresh protection to the floor, since the water damaged-poly likely lost some of its protection integrity. Now we have a ton of fine swirl scratches everywhere. Not sure if it is due to using a 150 grit or perhaps they were too aggressive with the buffing machine or both. What do you find is the most likely cause of swirl scratches with undergoing a screen/coat process? I should also say that, with our flood, not only did it make the poly look weird, but we noticed a very minor waviness of the look of the floor. But, when we rubbed our hands on the floor, we never felt the waviness. So, not sure if that waviness was just part of the weird look of the water-affected poly or if the wood itself was wavy. But, I will say that the waviness is now totally gone. I’m just reading this comment. Based on this, it would have been safer to sand the floors, not only for the waviness but also, the water may have done more damage to the finish and it would have needed at least 2 coats of poly. In general buffing does not take care of waviness. Sanding does. I can’t say what you had before (as I didn’t see it). Maybe what was done got rid of one issue, but created another. I would probably sand and refinish at this point and it would have been the safer route from before. Not sure if you’re covered by insurance. I have an article on that for the site (if you put “insurance” in the search bar, it should come up. Michael – Yes, it sounds like the grit was too rough. It’s possible it was wrong machine too. As an aside, the moisture should have been checked, too (so hopefully that was done via a moisture meter and generally it’s safer to wait 30 days from the damage…as there could be moisture in the subfloor). 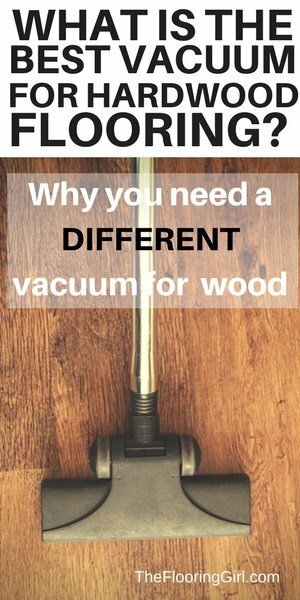 Either way, it sounds like you have an issue, and most likely you will need to have the floors fully sanded to get rid of the scratches. Thank you! In order to remove the swirl scratches, I fear that if we sand this section of floor to get rid of the swirls and do another coat of poly, that the flooring will turn out too glossy compared to the rest of the surrounding flooring. With the currently new coat of poly, it’s already quite glossier than the surrounding flooring (which was last screened and coated about four years ago). What is the difference between “buffing” and “sanding”? Is buffing when you use a “screen” as opposed to “sandpaper”? Michael – First, the gloss level of the floor is dependent on the poly sheen used, not the number of coats of poly. So, if you want less shiny, you should do a satin finish, no matter what you do next. It sounds like your installer didn’t discuss this with you (another bad sign). So see what was used, and then move down at least one level. But, generally satin is the most popular. Semi gloss and glossy are very dated and they show the imperfections more…which in your case is even more of an issue. Second, screening = buffing. It just means you’re buffing the top coat of poly and not sanding the wood. Given where you’re at now, this probably won’t work…but of course I can’t see the floors…and regardless, you may not know for sure until after it’s done. But, now it sounds like your floors are scratched. Sanding means to fully sand the floors down to the bare hardwood. This is probably what needs to be done. But, if you want to try to screen…and then it fails, then you could do this and then if it fails, then sand. It’s just that it’s probably going to waste more time and more money. A full sanding will always come out better than just screening and especially after water damage, and especially hearing your descriptions. This question concerns water based Bona Traffic HD. Which is more popular in the NYC/CT area – Natural or Amber. In addition, is there another light color that you would recommend aside from these two? Sherry – By far, natural is the most popular. Very few prefer Amber. I would strongly recommend natural, and no stain color based on 1) popularity, 2) easy to decorate with, 3) ease of keeping clean. Here in Westchester/Fairfield Counties, most are strongly prefer this when they are going light, especially higher end customers. It’s probably a 90/10 ratio. Hi, I am finally refinishing my floors and returned to your blog. My plan is to do Natural on my red oak floors as per your suggestion, but I have also now heard about Nordic Seal. Could you elaborate upon the difference between Nordic Seal and Natural? Thank you!! Sherry – When you do natural, you can put a sealer on for the first coat. Bona now has 5 “shades” of sealers. Classic is the original and is natural. Nordic has a BIT of a whitish/grayish tint. If you’re doing for more of a nordic of tint of whitewash look, it’s a great choice. I believe all of their sealers are priced the same (or just about the same) and they are all same quality. It’s just the tints are slightly different. Note: After the sealer goes on, you 2 coats of the regular Bona Traffic poly. I hope that made sense. So now I am a bit confused. In the October post to me, you suggested natural, no stain. When you say natural, do you mean Classic or Natural and which do you prefer more? Also, what do you think about using DTS and then Traffic HD? Finally, will any of these appear more pinkish on the red oak? Do you mind the pinkish tone? Thank you!!! I realize this is personal taste, but your opinion would be appreciated. Here is my question in a more organized way. Right now, I have a sample of Bona Classic Seal, Bona Natural Seal and Bona Intense Seal (formerly DTS) on my red oak floors. In all cases, I will use 2 coats of Traffic HD poly as the final coats. Which is the most popular in the NY/CT area? And I am curious – which do you prefer? Having now seen the Nordic, I will not go with that. Thank you!!!!. Classic seal is most popular. It’s the most natural look. then, yes, use 2 coats Bona Traffic HD on top. You have been very helpful. When comparing the three sealers, that is the one I kept going back to. Thank you! Oh good. I’m so glad. Thank you for the information here. We recently moved into a house that has 20 year old maple flooring in about 800 sq ft of the main floor. We’d like to add wood flooring where it doesn’t yet exist on that same floor for a total of 1400 sq ft. In our last home we had recently installed 8″ wide oak and put a dark brown finish on it – we really liked how it turned out. 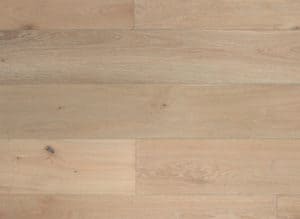 As we learn more about maple floors it looks like adding a dark stain is risky as the wood doesn’t absorb it well, or evenly. We’re debating on whether to attempt to stain the wood to a medium/dark or go with the Bona Traffic HD and a very light, natural look. We’d prefer the former, but would like to understand your view of the risk. Also, the planks are narrow (2.25″). So…there’s always the option of tearing it all up and starting over but doesn’t feel efficient. We prefer contemporary style with light grey walls and white cabinets. Any advice would be helpful. Mike – Oh yes, this is a toughie and I think you hit the nail on the head for the issues. Clearly going natural with Bona Traffic is the safer route. And, clearly the 2 floors will NEVER match in color nor graining (unless you switch the old maple out). I would do what you love on the oak and I would probably leave the maple in place for now (given budget and not wanting to waste the wood) and consider the long term plan to replace it, maybe 5 to 10 yrs down the road. What I would probably do is look in the stores to see how the stained maple looks and see if you like the look and can live with it and/or like how some of the colors look. If you do, I might keep an open mind and when they come to stain it, have them test it with the stains before making the final call. Look at the maple with the stain samples next to the oak and then decide. Also, believe it or not there are many species (or maybe subspecies) of maple, so the stain may look different than what you see in the store. Some of the maples we find in houses from the 1800s and early 1900s are different (and softer) than what they generally sell today (which is usually hard maple). Make sure you hire a great sanding place and one that has plenty of experience with maple as it is tricky. Make sure they use a conditioner to close the pores and reduce blotchiness. Also, just to throw this out there as an alternative…for a contemporary look. You could go gray on the maple. Maple looks great in gray and it’s easier to get a gray look on maple than on oak. 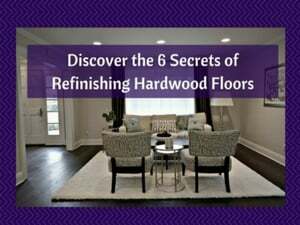 I have an article on staining hardwood gray (and you should be able to find on the side bar and/or in the search button. Thanks for the quick reply. Let me clarify something based on what you said…you don’t think it will be a problem matching the old floor to the new floor as long as we get it 2.25 maple and sand/stain it all at the same time, right? 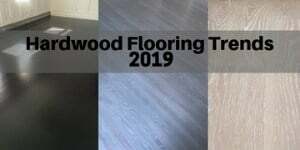 We’ve been under the assumption that even though the original floor is 20 years old it will still match the new floor just fine if they are all the same species, width, and finished together. We’re being quoted like $14-17k for this project so don’t want to mess it up. And we do like the gray look, but we just worry it will date the home faster. We have a 23 year old home with hickory kitchen cabinets with an oak color stain. I know the trend is white cabinets, but the counters are granite and I don’t feel the color of the granite would go with painting the cabinets white. We currently have white tile in the kitchen that I would like to replace with wood flooring. We also have a 50 lb dog. What color of wood floor would you suggest and are there certain types that are more durable for dogs? We would probably extend the flooring into the family room as well (it now has carpet and we are planning to replace it. Susie – In terms of what will hold up best with your dog for the floors, I would go natural. 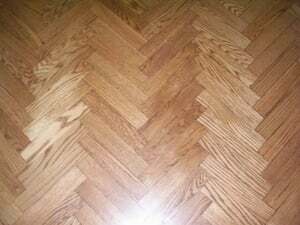 I’d probably do oak floors, too as the graining will help hide things. Hickory holds up well, too but may be too busy. Now, while that’s what’s best on the floor, I do not think that will go well with the cabinets and you should strongly consider painting the cabinets. I’m surprised that you don’t think white would go with your granite, as white is so neutral and seems to go with every type of granite I’ve seen (from light to dark). But, if you feel that’s the case, you could paint the cabinets another color (e.g. some sort of cream or gray). It’s hard for me to say as I can’t see your granite. But, if you have hickory for cabinets (which has strong graining), it probably won’t go with any hardwood floor…too much wood, too busy. Noah – It’s a great color, but it’s next to impossible to find in prefinished wood. That may be because it’s fairly new. A while back, Shaw used to have a black hardwood that looked deep – almost painted. But, it was also distressed/handscraped and it only came in engineered. They discontinued it maybe 4 years ago or so (which is too bad). It was called Cosmopolitan Maple. We did that for a customer years ago, but you won’t be able to source the product any more. I’m not sure if there are other truly black products available in prefinished. 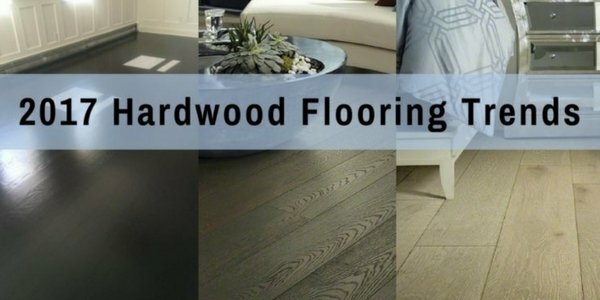 Maybe you could try going to a local hardwood store (not Home Depot, nor a carpet store), but a real flooring store (and one that’s large). They may have one or may be able to point you in the right direction. I hope that helps. And, thank you for the kind words. That means a lot to me. Great blog and lots of valuable information. We are in the southeast and we have just hired a recommended contractor to replace our floors. We decided to go with white oak because its suppose to be a little stronger etc. Our dilemma is picking a color that will go well with our light maple cabinets and center island. We were thinking of applying a natural colors for its a little darker than cabinets etc. Plus, our furniture is dark brown. We appreciate. any suggestions. I love white oak. And, it’s better for the kitchen since it’s more resilient to water. Personally, I would go a bit darker so you have a better contrast with your cabinets. If you natural, it may look too close and therefore look off vs the cabinets. I’d probably try something in the mid range that is brown or else go darker. So for mid brown, I’d test special walnut (mid brown) and provincial (mid brown w/ some red undertones). If you want to go darker, try dark walnut and/or a 50/50 blend of ebony/dark walnut. I’m not worried about wood furniture. Usually wood floors and wood furniture go no matter what you do. Hi Debbie, I recently came acroos your website and it’s very helpful. Thank you. I’m looking to get our hardwood floors refinished and got some quotes. the contractor said he was going to use duraseal stain in jacobean (he asked if we want light or dark jacobean??) and then put 2 coats of sealer and top coat of satin sheen. I’ve asked for the brand of poly coat and he said glitsa. Do you recommend glitsa, is that even poly? should I go with this guy or look somewhere else? Sai – Regarding the stain color, you should test it on you wood to verify that you like it. I think jacobean is a great option, but always test some shades around it. I would test dark walnut (which has a bit less red) and an ebony/jacobean combo (50/50). Re: poly, glitsa is a pretty good option, BUT Bona Traffic HD is a better option as it’s stronger/lasts longer. It does cost more though, but it’s definitely worth it. So, the contractor would charge you some more money and that would be justified. Usually, you do stain, 1 coat sealer and then 2 more coats of poly. Hi! Your posts have been very helpful. We are in the process of getting a home and trying to decide what flooring to put on the stairs/ second bedroom, we are leaning toward the luxury vinyl and curious your opinion on what is a better trend, the vinyl that has “grout” or no grout, I’m sure some of it is personal preference but wondering your feedback! thanks! Jen – Thank you so much. I really appreciate that. 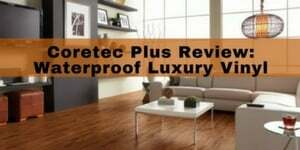 For the bedroom and/or any other flat areas, I’d recommend Coretec Plus (or something similar). These are much better than the tile ones w/ grout (which are harder on your feet…and incidentally more expensive). From an aestetics standpoint, Coretec all the way. Tile just doesn’t look right in a bedroom. And, Coretec (or EVP) will be a bit warmer due to cork underlayment). BUT, I would NOT recommend any of those for the steps. 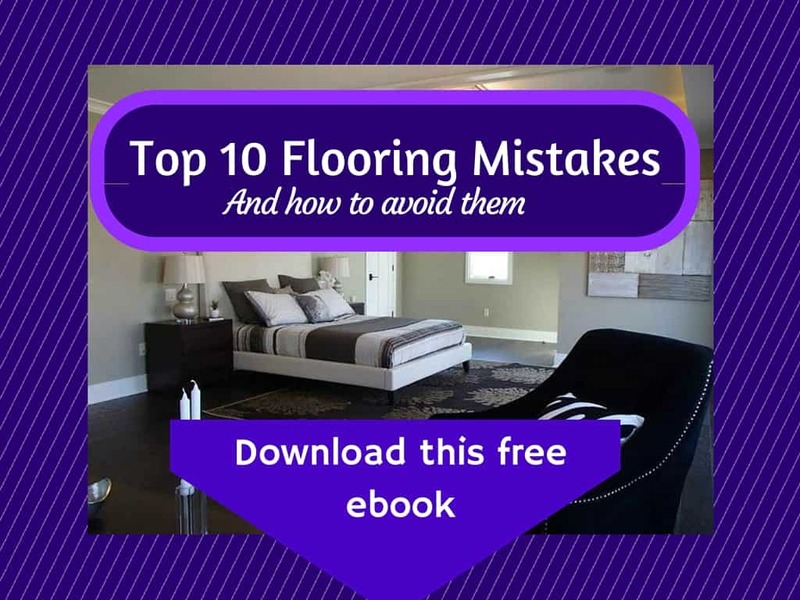 They are just not safe as they are floating floors and need overlap reducers which look sloppy and can also create tripping. First choice for steps is always solid hardwood treads. Second choice is carpet. If you have hardwood treads, leave them (and/or stain to match coretec) and then add a carpet runner on top for extra safety, style and noise reduction. Thanks so much for the reply! We’ve been planning on using NuCore which seems very similar to Coretec, but they are vinyl and have options that have a fake grout like a grout apperance on the vinyl edges but if we want to go with a wood look, would you suggest not getting the one with grout? Also, we are doing porcelain on the first floor so not sure what to do now on the stairs because I think carpet may look funny in between two hard surfaces if you have any ideas! Oh gosh, Jen, I don’t know how I missed this question. Sorry about my delayed response. First, NuCore is an inferior product. It’s thinner and doesn’t seem to hold up to the waterproof claims they make. I would recommend Coretec Plus over this. 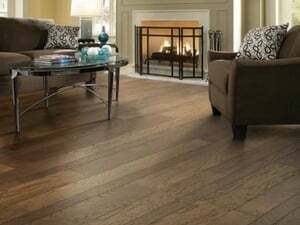 Second, most people prefer the look of hardwood since it’s much more in style and they look more real. They also have a much wider variety. Neither luxury vinyl nor tile are safe for steps. I would do hardwood treads and carpet runner for safety. If you can’t do that, then wall to wall carpet. Hi! I love this post. I have new beautiful chevron floors and felt excited that my instincts on our new home were in line with your recommendations and timeless trends…I know that is an oxymoron. Here is my question: in our master bathroom, we want to us hardwood floors. Our contractor is suggesting one of the tile products that look like wood for maintenance reasons…any thoughts? Kristin – Glad to hear that. Okay, I’m not sure where you live, but tile floors that look like hardwood would definitely not be my first choice for a bedroom. In fact, it would be one of my last choices. 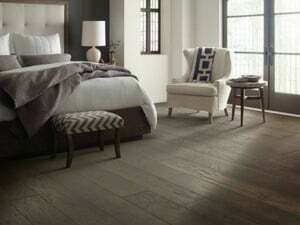 So, while I love tile that looks like hardwood, I almost never see it in a bedroom. I saw it once in our area, and it was such a turn off. Here’s why. 1. Hardwood is by far the preference and will improve the value of your home, 2. hardwood is timeless…and will last more than 100 years and can be refinished to change the color to go with the trends (you can’t do that with tile). 3. tile is cold on your feet…a definite no no in our area (New York) and I can’t imagine it anywhere in Northeast or MidAtlantic or Midwest…or any place that gets chilly in the winter. 4. tile is hard on your feet. Again, I can’t imagine touching down on tile when I first wake up. Tile that looks like hardwood is great option for areas that can get wet or moist – e.g. kitchens, bathrooms, mudrooms, entryways, etc. Now, if you live in a warm climate, the issue of coldness would not be an issue. All the other issues would be. Regarding maintenance, tile floors are usually more maintenance vs. hardwood. They are harder to clean (due to grout) and you need to reseal grout annually. Tiles can crack as well as they do become dated often 10-20 years later. But, with hardwood you will need to eventually refinish the floors (maybe in 10 years). This is my opinion, and feel free to disagree with it. I would either try very dark (e.g. dark walnut or dark walnut/espresso, antique brown) or very light without the yellow (e.g. no stain with Bona Traffic HD. Also on the light side, using Bona NordicSeal as your sealer (a tad of white) or even a whitewash could work. (see: Bona NordicSeal and best brand of water based poly).